Millions of pounds are being invested in British rail infrastructure over the next few years to help the industry cope with increasing demand. Developers need to be looking closely at design if they are to ensure a commuter’s journey is safe, convenient and an overall positive experience. During the Sixties, two reports written by Dr Richard Beeching on the UK’s declining railway system resulted in the closure of 5,000 miles of track and more than 2,000 stations which served them. The closures were necessary, he said, as travellers were increasingly choosing to travel by car, fuelled by the end of petrol rationing. Today, the trend for train travel is renewed and millions of commuters are once again relying on Britain’s rail system. But the industry is facing a new problem - one of overcrowding and a need to make sure their stations are able to keep up with demand. In the financial year ending April 2014, 1.59 billion train passenger journeys were made in Great Britain, while The Department for Transport has seen passenger numbers double in the last 20 years. With no sign this trend will reverse, the nation’s train companies are planning major network expansions with projects such as Cross Rail. Another noticeable development has been plunging approval rates amongst passengers about the overall train travel experience, with survey figures from the Department for Transport the lowest in a decade. For their money, passengers want to see continual improvements to their train experience, with considerations for convenience, comfort and – above all – safety, high on their list. There are more than 80 new railway stations proposed for the United Kingdom, some to serve as brand new facilities serving remote areas, others like East Leeds Parkway and Birmingham Interchange to ease demand within major cities. Those behind both new and revamped stations need to make sure key considerations are given to improving customer relations. Great station design should take the hassle out of commuting, and to that end the daily commute should be seamless from car park to platform, footbridges to stairwells, and ticket machines to kiosks, enhancing the whole passenger experience. From the moment passengers arrive at a station to the moment their train departs, it should be reasonable for them to expect a well-designed, well-maintained and well-run train station. Ideally they should go on to enjoy a relatively disruption-free journey. So how does that happen? One solution is to consider laying uniform paving design both inside and out of the station – we undertook one such project at Corby train station in Northamptonshire, where the La Linia range of concrete block and flag-textured paving proved such a hit with travellers that plans are now underway by Corby Borough Council to extend the flooring scheme all the way into the town centre. The striking colour scheme also served to mark out different areas of the station entrance, separate from the roads which ferry incoming passengers by car and taxi. The same method of marking out pedestrian areas was used for work at Manchester Piccadilly station, one of the UK’s busiest. During peak hours, access to the station via bus and coach is especially frequent, which called for traffic calming measures and a distinguishable pedestrian area. As well as for visual appeal and safety, the materials used when revamping an existing station or furnishing a brand new one must be hardwearing and capable of handling daily passenger numbers, whether they be in the hundreds, thousands or even millions. From lengthening platforms to using street furniture to disperse large crowds, durable, high-quality materials are needed to minimise repair and the need to replace, and keep the commuters coming. Even down to the bins at the entrance to your station, make sure these are tough enough to withstand the weight of litter and being emptied several times a day. In a busy environment, the ability to display the latest news on train arrivals, departures and updates to schedules is vital. To ensure passengers were kept up to date, one Dutch firm trialled an LED strip above each platform at Den Bosch station which showed not only the train times but also how busy each service was with an appropriate colour display. Customers who previously felt squeezed and stressed gave the railway company higher satisfaction scores in a survey following the trial. Accessibility is another key area for travellers, and thoughtful adjustments will score highly where they make journeys enjoyable for passengers with mobility issues. We achieved this on the London Underground’s Victoria Line where we added platform humps using bespoke platform nosings, to give step-free access for everyone whether they were using a wheelchair or carrying heavy luggage. In case you missed us. We recently exhibited at Railtex 2015 – along with over 430 other rail industry suppliers and designers - to demonstrate the key materials and products designed to aid passenger journeys right to the platform edge. Our video shows some of the products we demonstrated that have been created with accessibility, safety and design flair in mind. Our stand was mocked up like a railway platform, including a full spectrum of products which are designed to enhance the rail passenger experience. 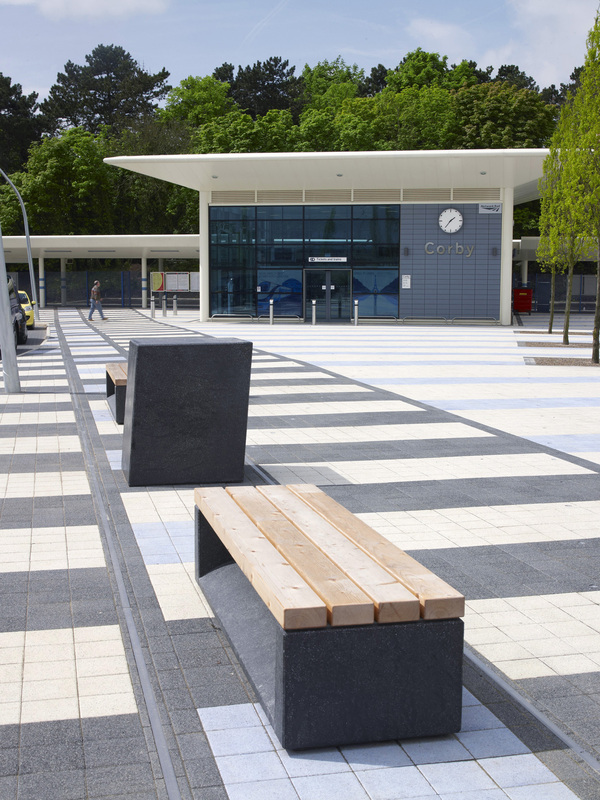 Our products can significantly improve the ambience within the station environment from different colours and material finishes for internal and external paving areas whilst our extensive range of street furniture in a wide range of finishes, styles and textures can enhance the station architecture encouraging travellers to sit, relax and enjoy their surroundings whilst waiting for a train. With millions being pumped into the rail network, Britain’s stations are expected to see dramatic changes and upgrades to fully meet surging demands. As they’re joined by brand new points on the map, the country finally appears to be bouncing back from Beeching – and from a design perspective influenced by new ways of thinking, the timing couldn’t be better.